Heartbreaking news today- Reports show at least 94 migrants died Thursday off the coast of Lampedusa, an island south of Sicily after their boat sank. According to officials the boat sank after a fire began onboard. More than 200 people were still missing of around 500 people, officials said. 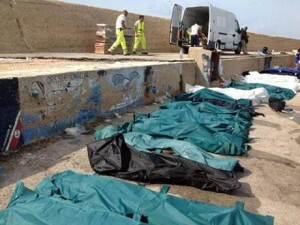 According to the International Organization for Migration, 25,000 people have died in the Mediterranean in the past 20 years, including 2,000 people in 2011 and 1,700 people last year. In the first nine months of this year, 21,780 migrants reached Italian shores, 4,000 of them children, according to statistics released by Save the Children. Most of the minors were not accompanied.